On April 16th of 2015, the Department of the Environment (DoE) released stringent guidelines designed to increase the energy efficiency of water heaters. The news laws require water heater manufacturers to abide by strict energy-saving guidelines in order to cut down on energy usage and associated costs. To help our customers take advantage of these new, incredibly efficient water heaters, your local plumbers at Master Plumbing and Mechanical are here to help! If you’d like to replace your water heater with a more energy-efficient model, we have many models to choose from. And as a special bonus, we are offering a special deal for all of our customers who decide to have us install a new water heater: You can enjoy $100 off your purchase. This offer is good until July 1st, 2016, so be sure to call us soon to schedule your water heater replacement! Is your water heater on the way out? Now’s the time for a new one! Hot water heaters are a major user of energy and they can have a surprisingly big impact on your energy bill at the end of the month. 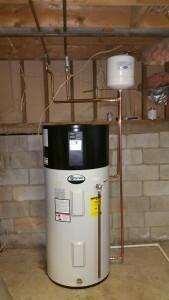 In addition, a new water heater can also make your home more efficient. A tankless water heater provides hot water on demand, which means that it is both cost-effective and can also instantly deliver as much as hot water as needed. With a tankless water heater, you’ll no longer have to worry about whether your roommate took a shower before you and used up all the hot water because it will always be in full supply! There are so many benefits to investing in a new hot water heater that with our current offer of $100 your purchase, there’s really no reason to delay. Start saving on your energy bill immediately and find out the benefits of a new hot water heater for yourself by giving Master Plumbing a call today! This entry was posted on Thursday, April 28th, 2016 at 4:28 pm. Both comments and pings are currently closed.